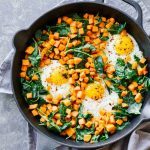 This Skillet Sweet Potato Hash is perfect for a healthy weekend brunch! Sweet, savory, hints of spicy, delicious flavor, and a runny egg. SO good and super easy to whip up. You guys have probably figured out my slight obsession with sweet breakfast recipes. Healthy French Toast, Pecan Pie Pancakes, Gingerbread French Toast, Buckwheat Pancakes, Healthy S’more Pancakes, Mocha Peanut Butter Protein Pancakes, Almond Flour Waffles….so many faves! But other than this Poached Egg & Avocado Breakfast Salad, I’ve never really been one to make savory food for breakfast. 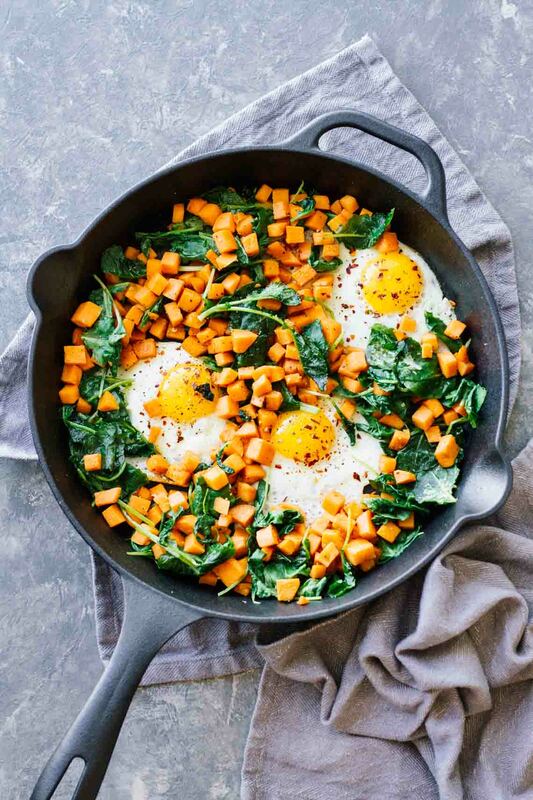 Today I decided to venture out a little and make this Skillet Sweet Potato Hash with Kale. LIFE. CHANGED. The food nerd in me is exploding with excitement! Garlicky, savory, hints of sweet, hints of spicy, runny egg, in-your-face flavors. All of that under 30 minutes! So I’m thinking breakfast for lunch, breakfast for dinner, breakfast basically all the time now because of this deliciousness. It’s THAT good, friend! The health nerd in me is also super excited about the nutrients in this recipe. Sweet potato has so much vitamin A and C it’s also a great source of fiber and potassium making it a super healthy addition to any meal! The eggs also contain lots of protein and healthy carbs for energy! Peel and chop the sweet potatoes into small squares. Melt the coconut oil in a large skillet and add the garlic. Cook the sweet potatoes in the oil and garlic until they are about 90% done. Add in the baby kale and cook until soft. Remove the sweet potatoes and kale from the skillet (temporarily). Crack the 3 eggs over the skillet, allowing the egg whites to fully cook. Add the sweet potato and kale mix back to the skillet. Top with salt/pepper and crushed red pepper. I love brunch recipes with eggs, so looking forward to trying this! Hi – Doing this recipe tonight – You don’t mention what to do with the Garlic in the recipe, – but I want to use fresh minced garlic, I’ll work it in there at some point. — Interesting concept, somehow get the kale and potato back in the skillet, around the eggs I guess–? I may do poached eggs and add to the dish when served, on each plate. AND – I found this recipe through my Yummly subscription. I went there, saw the recipe for a few seconds, then it disappeared and an error message says they can’t find it. Over and over I tried to see the whole recipe, but it kept disappearing and I never could get to the instructions page. I Googled the recipe, found your page here – But I thought you should know something is wrong with Yummly’s listing. Hi! Thanks for stopping by! You’re totally right, I completely forgot to put that in the recipe. Updating it right now! Sautee the garlic with the coconut oil and sweet potatoes to give them a really good flavor. Minced garlic works perfectly! Yes, I placed them around the eggs, but this is just to make sure everything is equally warm when serving. Adding a poached egg to the dish when served works completely fine and wouldn’t sacrifice flavor!